The National Hockey League’s Trade Deadline is 3 p.m. ET on Monday, Feb. 25, and teams will be making decisions on whether to buy or sell and decide which players can make the biggest difference and hold the greatest value. Check out the latest trade rumours and speculation from around the NHL beat. David Staples of The Edmonton Journal wrote Monday that he interprets Rishaug’s report to mean that Kailer Yamamoto, Tyler Benson, Cameron Hebig or even Jesse Puljujarvi could be on the move depending on the Oilers’ return – in addition to one their NHL goaltenders and a first-round pick. 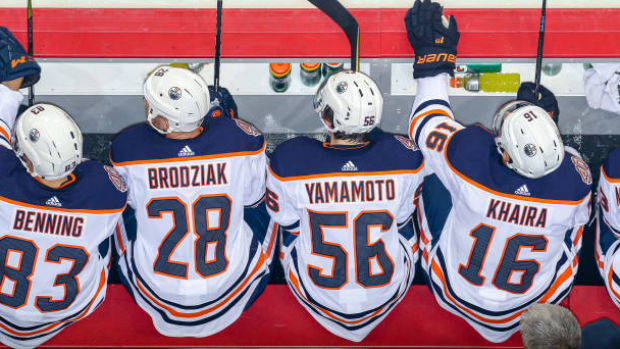 In TSN’s Core 4 Under-24 rankings in November, Yamamoto was ranked No. 5 on the team, while Puljujarvi, the fourth overall pick in 2016, was ranked No. 6. Benson, the team’s second-round pick in 2016, and Hebig, signed a year ago out of the WHL, were not listed in the team’s Top 10. Staples believes the Oilers could afford to part with either Cam Talbot or Mikko Koskinen in net and call up AHL netminder Shane Starrett to serve as the team’s backup. He argues, however, that choosing the wrong goaltender to trade away could cost the team a playoff spot. Staples notes that Chiarelli has failed to improve the team’s fortunes with two of his moves this season – trading Ryan Strome for Ryan Spooner and moving Drake Caggiula for Brandon Manning. However, he believes the Oilers should still try improve their club for a playoff run. With Monday’s blowout win over the Buffalo Sabres, the Oilers sit tied for the final wild card spot with the Minnesota Wild, who have one game in hand. The struggling Anaheim Ducks traded veteran forward Andrew Cogliano to the Dallas Stars on Monday for forward Devin Shore, but general manager Bob Murray said more changes could be on the horizon. With the Ducks in the midst of an 11-game winless streak, Murray said the team is looking to get younger and find offensive help for the playoff stretch. “We’ve been trying to change things since the last time we talked. This became available,” Murray said Monday. “We’re trying to get younger, but we’re also looking for people with a little more creativity because we’re not scoring enough goals. It’s not fair to single out (Cogliano). It’s not because of him. It’s just something that became available. Murray added, however, that the changes could expand beyond the team’s immediate future. Murray said he will remain active in trade talks and called out the team’s younger players to step up. “I’ve been talking for a long time,” he said. “I’m trying to create. Definitely, every day, we’re trying to get better,” Murray said. “It’s difficult, but some things all of a sudden can happen. I don’t know when they will, but my whole focus right now is on players. We’ve got to get better. The Ducks are one of four teams, along with the Minnesota Wild, Edmonton Oilers and Vancouver Canucks with 47 points in the Western Conference standings. Anaheim will visit the Detroit Red Wings on Tuesday hoping to secure their first win since Dec. 17. Jimmy Howard’s future with Detroit Red Wings remains up in the air as the veteran goaltender plays out the final season of his contract. The 34-year-old, who was listed at No. 9 on the TSN Hockey Trade Bait list last month, told The Detroit News on Monday he’s hoping to stay put in Detroit. “With the trade deadline coming up here, it’s pretty much wait-and-see,” Howard said. “There’s always a chance, I guess. I’ve been through this a couple times. But you just can’t think about it, until it actually happens. Howard has spent his entire career with the Red Wings after being drafted 64th overall by the club in 2003. He has a 12-12-5 record this season with a .916 save percentage and a 2.77 goals-against average.